Use FiT!® and save up to 50% over other brands. This highest quality German developed and manufactured product comes from the factory - to Synca - to you. 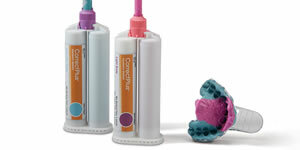 FiT!® Soft Putty (dark turquoise) is a non-oily formula that is easy to mix and insert into the mouth. Once set, FiT!® Soft Putty retains the stability necessary for accuracy. FiT!® Light body (pink) provides extraordinary level of detail comparative to the best materials available today. It flows perfectly into crevices under pressure without dripping. Innovative, the Correct Plus™ is a polyvinyl siloxane that offers an enhanced performance in a wet environment, making impression taking an easy and smooth experience.